New Chart: What are the Top Barriers to Reducing Readmission Rates? For advertising and sponsorship opportunities in the Healthcare Data Digest, please e-mail sales@hin.com or call 888-446-3530. 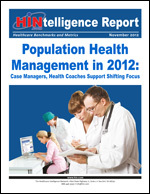 Free Download: Population Health Management in 2012. Delivers a snapshot of mobile health (mHealth) trends, including current and planned mHealth initiatives, types and purpose of mHealth interventions, targeted populations and health conditions, and challenges, impact and results from mHealth efforts. Reserve your PDF or print copy today. "For our program, we consider any patient that goes in to see a PCMH physician as part of that PCMH and eligible for the benefits that physician offers." Watch the webinar today or order a training DVD or CD-ROM.